This work marks the final stage of a project begun in 2008 through collaboration with Clare Women’s Network and supported by the Create, Phase I – Artist in the Community Scheme. Cleary’s decision to work with an ancient Greek myth for this cycle of images, came from a need to find distance and preserve anonymity, to offer a cohesion, or potential for meaning in events that so often seem to have none. It evolved in response to answers to the question, “What was the turning point for you?”. The choice of the story of Demeter and Persephone was inspired by real stories and accounts gathered through individual interviews and research into gender-based violence conducted over a two-year period. The work presented here consists of staged images or re-enactments exploring the regenerative or redemptive potential of the mother-daughter relationship, central to this myth, while also reintroducing it’s psychological complexity as a means to navigate contemporary experience. Martina Cleary is a multi-media artist working with photography, video, drawing and text as her primary media. In Ireland she attended NCAD and The Crawford College of Art & Design, followed by post-graduate studies at The Academy of Fine Arts and The University of Art & Design, Helsinki. Beginning in the early 90’s, her work has been shown and collected in Ireland, Finland and Germany. Recent shows and awards have included; The Irish Arts Council Project Award 2010, the Roscommon Arts Office Art@Work Residency 2009, EV+A 2008 (selected) at Limerick City Gallery and Impressions 2008 (First Prize) at the Galway Arts Centre. Cleary’s work has also been supported by Clare County Council, The Finnish Arts Council, The Finnish Cultural Foundation, The Finnish Institute in London and a number of other Arts organizations in both Ireland and Finland. 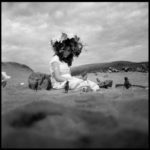 Along with her work as an artist, Martina is currently Head of Photography at Burren College of Art and also works as a lecturer in Critical & Contextual Studies at Limerick School of Art and Design. Martina Cleary, Premonition I, 2011, Giclee print, 40 x 40 cm, Image courtesy of the artist. Martina Cleary, Memoria, 2011, Lambda print, 100 x 100 cm, Image courtesy of the artist.